At each of the Sheds we need inputs to make outputs. Shedders and materials. What is great is to be a the receiving end of other people’s generosity. 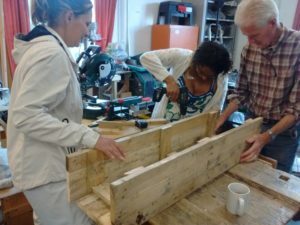 We also like repurposing materials that might be skipped. We are not above scavenging. 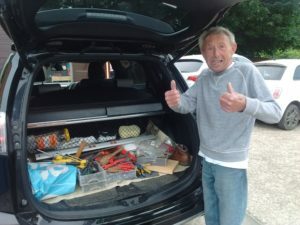 This week we received another tranche of goodies from our friend Mike (a friend of Shedder Dave). 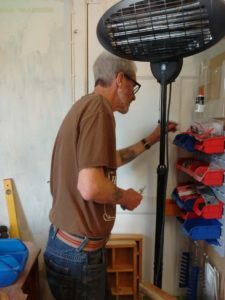 He is an informal Shedder and loves to help (did this week with finishing trunking) but is of a generous spirit brought on by a need to downsize his personal garage stuff. So we had another boot load of very useful miscellanea from him. 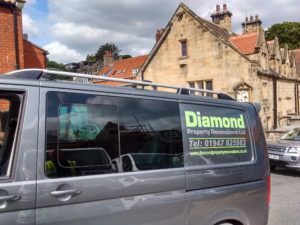 We also benefited from Diamond Construction working over the road on Springhill with some offcuts and being signposted by boss Darren to a skip in Newholme where they are working too. 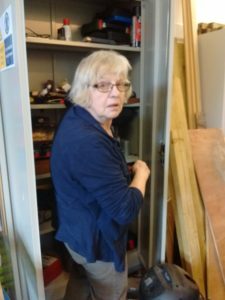 We got very useful bits (Betty came with Brian to rake through) but also soe pallets. 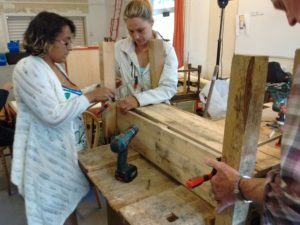 Below the results of using pallet wood can be seen in the form of a planter made by Tash and Julie. 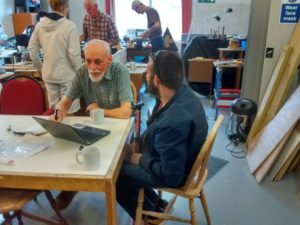 The past two days at Eskmouth have been quite exciting in fact with a new regular Shedders Tony with us and helping others. He is playing with the Dremel set at home to learn a new skill to benefit the rest of us! Marie has been away at Durham completing (she hopes) her course. Tash and Julie have joined this week and we had an excellent meeting with NYCC Living Well team. Linda began her first order for a snuffle mat. Finally some were there in the afternoon for a meeting with the Scouts and a C4 production company working with Wickes. Betty startled and confused. Sorry . . .